It was my birthday last month and my friend Mike bought me a copy of “Cigar Box Guitars” by David Sutton. 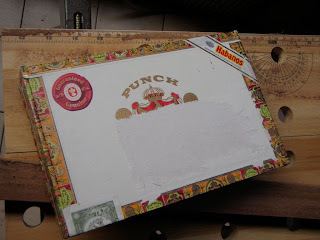 It’s a great book that explains not only how to make four different cigar box guitars, step by step, but also interviews some very interesting characters involved in the cigar box guitar scene. I decided to have a go at making one of the CBGs described in the book, and that’s what this post is about. 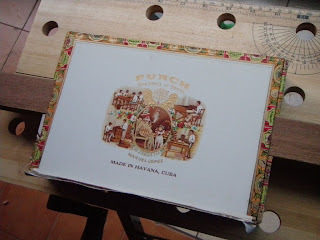 Firstly I got my hands on a Cigar box, graciously donated by another very good friend of mine (thanks, Kevin). I searched around for a while for suitable scrap wood for the neck, but in the end I just bought some really cheap from the local B&Q (yes, even Taiwan has B&Q). 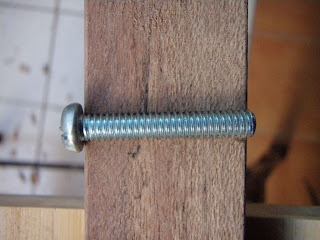 In the meantime, I’d managed to find pretty much all the other parts required just lying around at home. Of course it helps that I tinker with guitars, so it wasn’t out of the ordinary for me to have a few guitar tuners and strings spare. There was a horrible “Smoking Kills” sticker on the top of the box with a pretty nasty photo, so that had to come off. 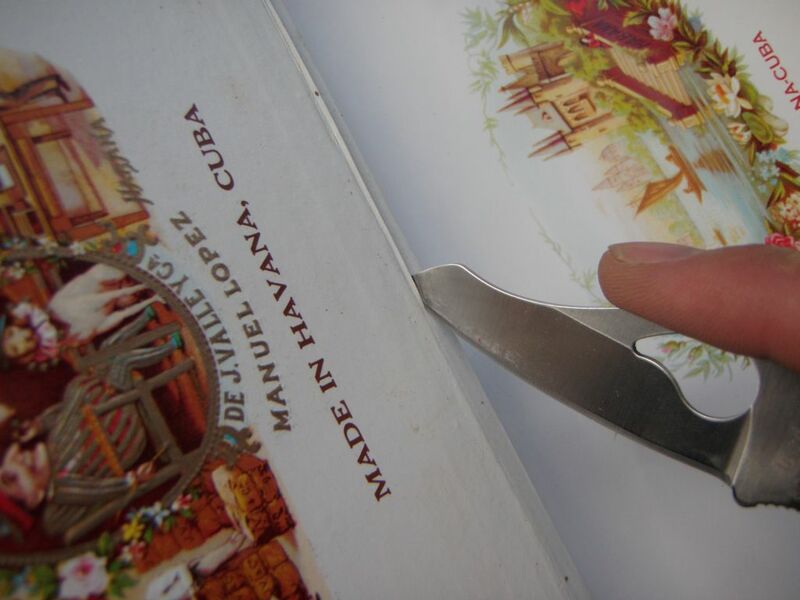 Unfortunately, despite being extremely careful, its removal really messed up the top of the box. 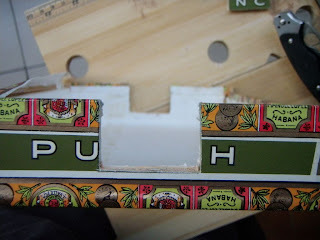 Luckily the inside of the lid had an even nicer picture, so I decided to cut the lid off, turn it upside down, and replace it. 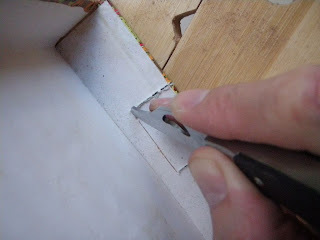 This had the additional benefit of letting me leave the lid off until the CBG was almost finished, giving me a bit more freedom to work with the box itself without having to worry about damaging the lid. Then I marked the cutout I would need to fit the neck, making sure to centre it correctly at both ends. The wood I got for the neck, incidentally, was 25mm x 35mm and some sort of hardwood. 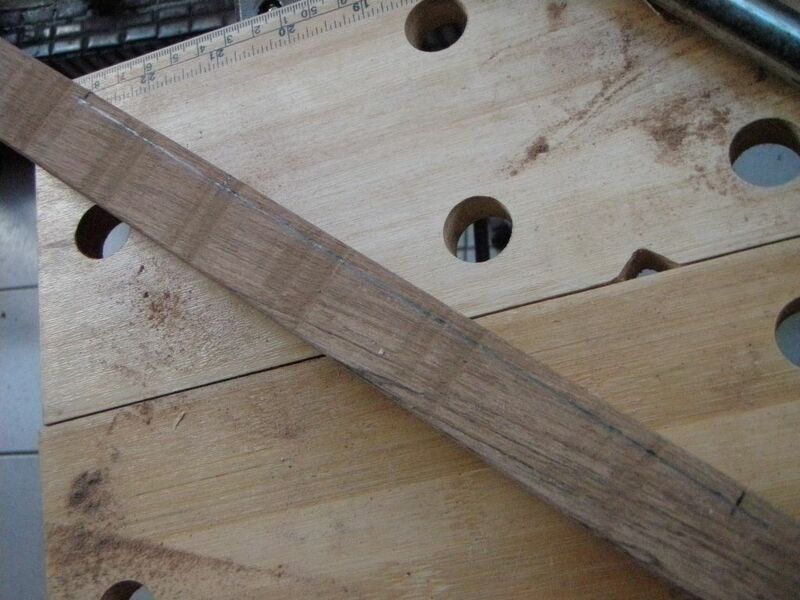 I’m not sure what it is exactly, but it kind of resembles mahogany, except with some spalting. If anyone would like to take a guess as to what it is, by all means leave a comment. The cutout was achieved with the help of a thin saw for the sides and a sharp knife for the bottom. The wood used on the cigar box (probably cedar) is thin, soft and easily cut through. 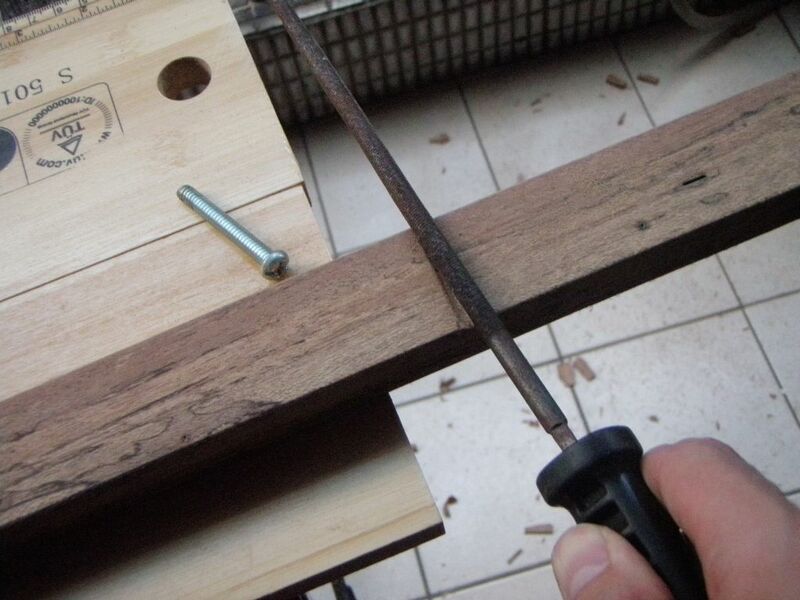 This is advantageous in some ways, but you also have to be extremely careful when working with it. 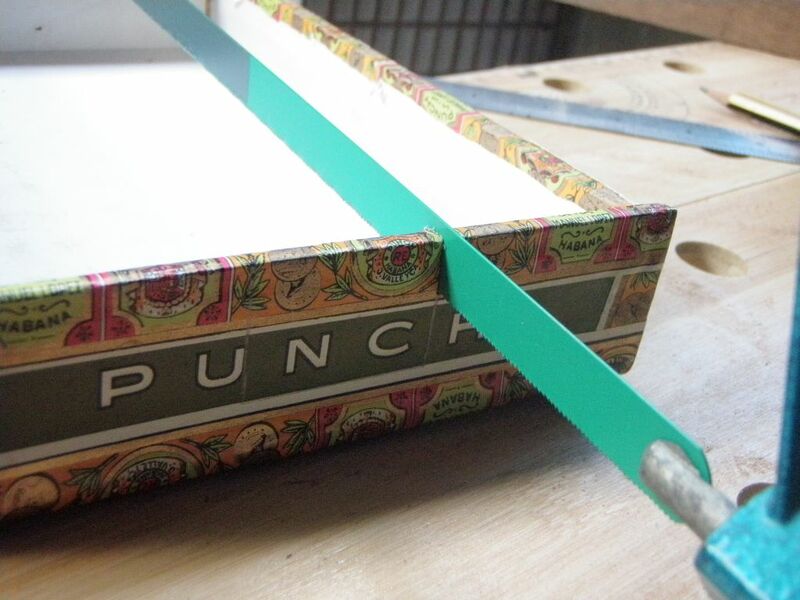 Make sure you support the box correctly while you are cutting. 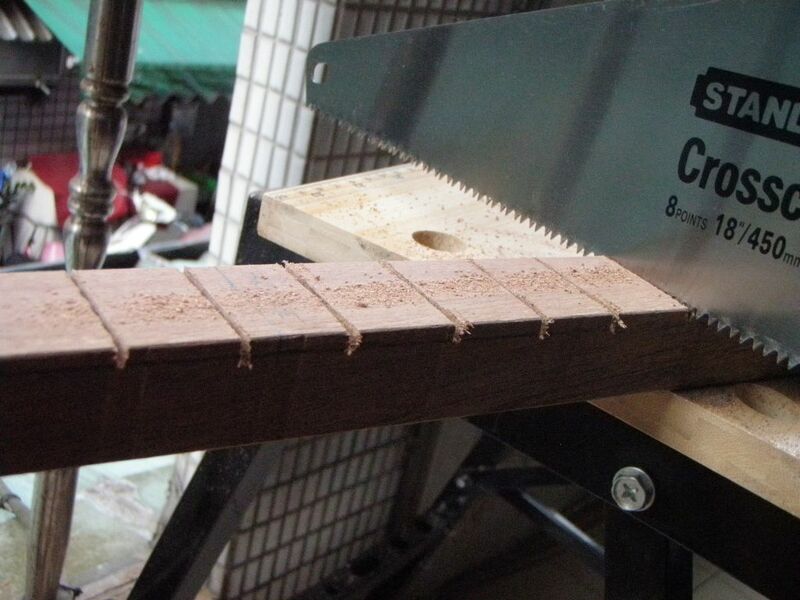 After cutting out the, erm, cutout, the neck is fitted to check that it sits right. Here you can see that it’s sitting a bit high. A little bit of filing of the cutout and the neck now fits much better. 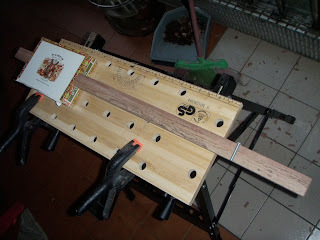 Now we do some work on the neck itself. 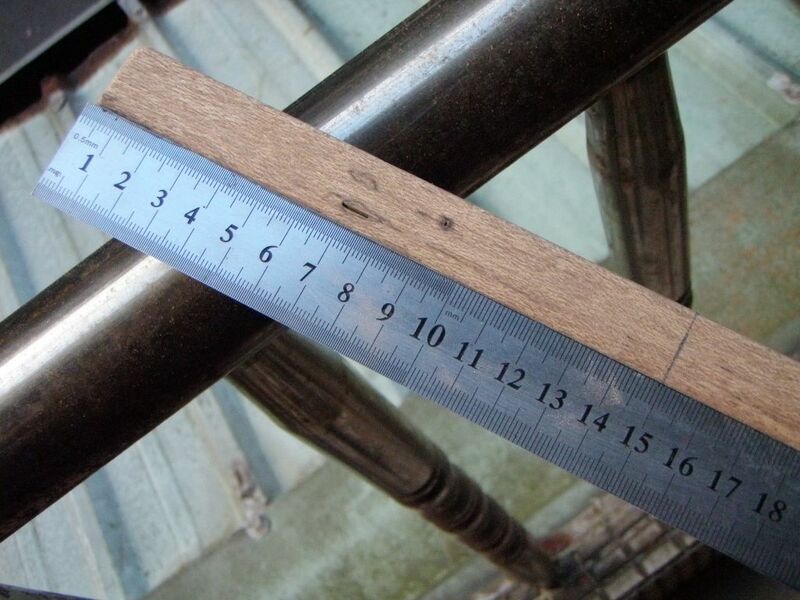 The piece of wood is currently 90cm long, and we mark off 15cm, which will be the position of the nut (giving us a peghead length of 15 cm), and then 77cm (62cm from the nut). 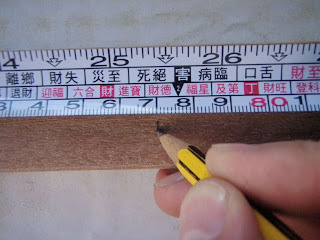 This second marking indicates where the bridge will sit, assuming we use a 62cm-scale neck. Of course you are under no obligation to do this. 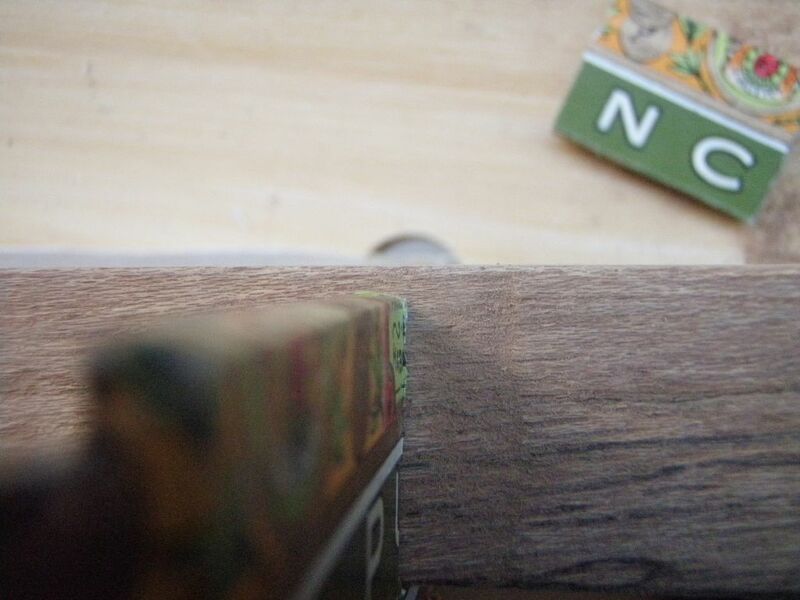 We don’t really NEED to mark where the bridge will sit at this moment either, and in fact we will lose this marking quite soon, but it’s good for estimating where the neck will sit in the box, length-wise. Oh and don’t be fooled by the 25/26 inch marking in the above photo. Some joker over here decided it would be a good idea to decimalise inches and a lot of rulers have those markings here now. 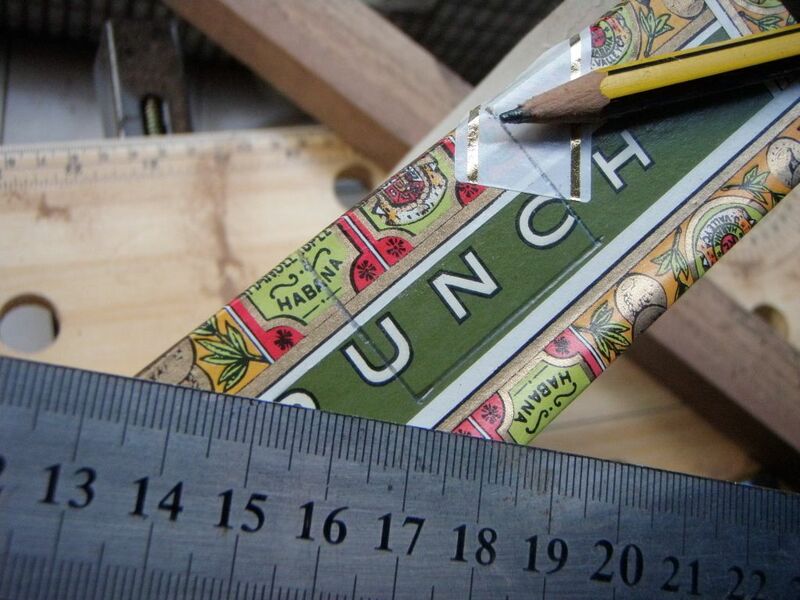 Imagine my surprise the first time I cut something that was supposed to be 5” long, only to find out I'd actually cut 6”. 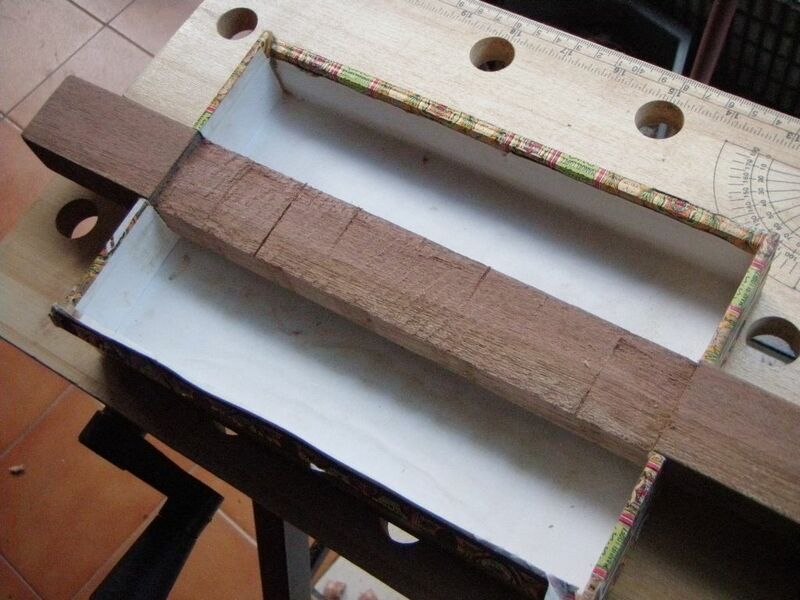 Here you can see the neck sitting in the box with the bridge in a suitable position. 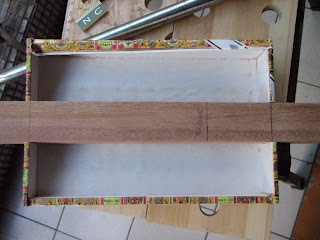 Once this position is decided on, you can mark the neck where it meets the inner edges of the box. The reason for this is that we will need to take some height off the neck between those two points so that we can close the lid. 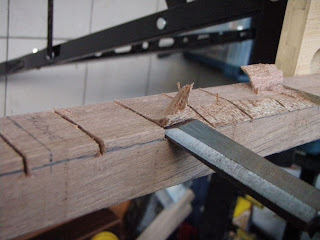 The lid is 4mm thick, so I mark how much needs to come off the neck. I start making cuts every couple of cm or so, down to the 4 mm mark. 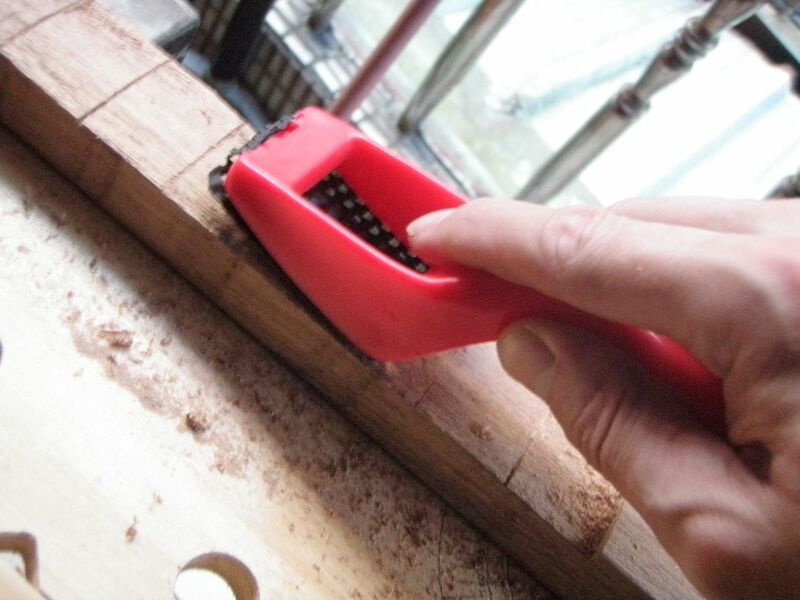 Finally I use a little one-handed rasp to kind of smooth it out. 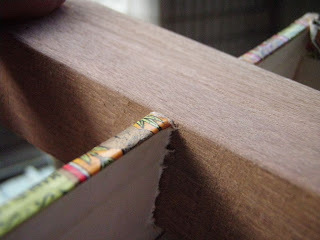 It’s a little rough, but it’s good enough, and it will be hidden anyway. A quick test with the lid and everything appears to fit fine. Now it’s time to make a nut slot. 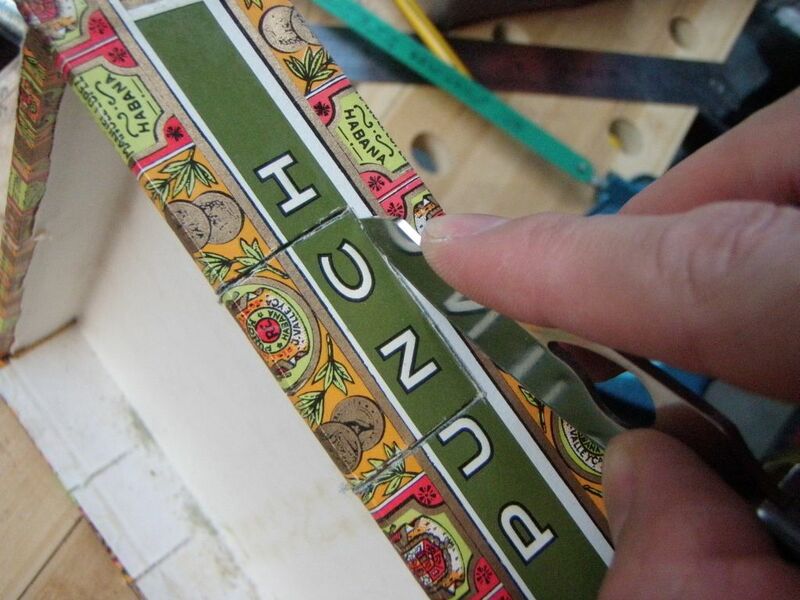 The nut itself will just be a bolt, so I file down enough with a round file to let it sit nicely in place, right where we marked that original nut position. The bolt is also cut to length so it doesn’t stick out at the bottom (be careful you don’t leave any sharp edges when you file it). As you can see, it’s getting dark, so we’re going to call it a day. Stay tuned for part two!